1. Preheat the grill to high. In a colander, pour boiling water over the spinach until it has wilted. Cool a little, squeeze out the excess liquid; set aside. 2. Cook the gnocchi in boiling water for 2 minutes, until they float, then drain. Mix the two cheeses. 3. Put the crème fraîche and mustard in a pan over a low heat. Stir in three-quarters of the cheese and heat gently until you have a smooth sauce (about 3 minutes). 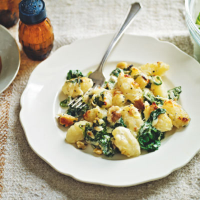 Season, gently stir in the nutmeg, gnocchi and spinach, and heat through. 4. Grill in a heatproof dish, topped with the remaining cheese, for 3-4 minutes until golden. Top with nuts and grill for 2 minutes. This recipe was first published in Sat Oct 01 11:57:08 BST 2011.